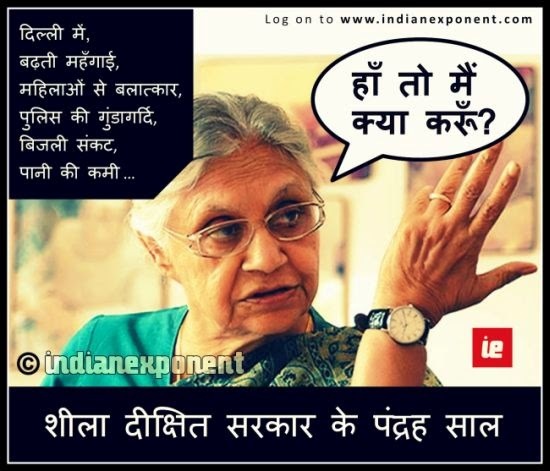 Just received a phone call – a friendly voice from Sheila Dixit’s office. For the first time in 15 years the 3-term Chief Minister made a contact. It should be like this – real contact between leaders and common people. The surprise lasted a few seconds because the real-sounding voice was a recorded message. Still, how many people can our chief minister’s office make personal calls too – yet a contact is appreciable. But what?? I heard Arvind Kejriwal’s name? Did I? how Delhiites should switch off their fans in 47 degree summer if they want to save on electricity. how it’s not a surprise that women don’t feel safe in Delhi as she herself doesn’t. how Delhi doesn’t have water for everybody, so can’t do much. how she doesn’t have power over anything – and all is controlled by the center. But could you not come up with anything original? BJP calls Kejriwal, Congress-agent. You call him a BJP agent. Both of you parties had enough opportunities to do things right, but you see one honest person, and everybody loses their mind. why is Kejriwal doing this? why did he just not joined Congress, or BJP? if he had stick to the “rules” he could’ve been a millionaire, like all of us. if not money, what does he really want? hmm, he has to be a CIA agent, what else? The problem is my dear Congress & BJP leaders – there’s no saving grace left for you. Tricks is all you’re left with. You can buy media, buy votes, manipulate faith, sell yourself to corporates – this is all you can do. Your entire foundation stands on dirty money and it has one aim to squeeze out the last bit of honesty from your leaders. Thieves don’t tell on other thieves. One basic fact you forget that people are not completely blind. Let me tell you what was expected of Kejriwal – he was expected to compromise at a later stage. He was expected to choose sides. He was expected to be absorbed by the existing political system, which may appear bipolar to the public, but is very much a single entity. Kejriwal’s crime in your eyes was not that he made a lot of noise and created a space for himself. His crime was that he refused to compromise – he openly showed intolerance to the lesser-evil. You just want us to pick the lesser evil today – till it becomes the monster that Congress is today. Your end-agenda is that the system must continue, doesn’t matter who is driving it. He has created a system which thrives on honesty. The system is in it’s nascent stage – but it has only one direction to grow. The moment it starts becoming dishonest like the other parties, it’ll lose all it’s support and the experiment will fail. A leader can control the party only in it’s nascent stages, later it’s self-powered. It may appear that leaders control the parties – but it’s vice-versa. Leaders do what they’re expected to do. Modi can’t even think of becoming secular – his supporters won’t let him. The challenge is to create a system which checks all the possible leaks. That system can self-run without becoming corrupt. This is what Kejriwal is yearning to do. That’s why he’s intolerant to lesser-evils, to compromises. That’s why he’s irritably idealistic. His intention is not to create another party for India. His aim is to re-immunize the entire political system so there’s no scope for corruption to infect it again.